The Land Trust’s Sturgeon Bay Ship Canal Nature Preserve is host to one of the region’s most robust populations of the federally-endangered Pitcher’s dune thistle, a rare plant that depends on open sand dunes. Researchers from Chicago Botanic Gardens and Land Trust staff hope joint efforts can keep this population healthy for years to come. But predators are lurking, including a non-native weevil that preys on the thistles’ flowers. 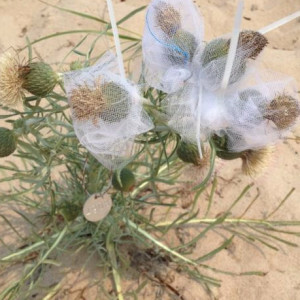 To help get accurate seed counts and harvest healthy seeds for propagation, researchers are enshrouding the most robust flowers of each mature thistle at the Ship Canal site with a special net. Each thistle is then marked with a numbered metal tag. Researchers and Land Trust staff also conduct an annual Pitcher’s thistle count at the preserve to determine how the population is faring. So far, so good as this population is still weevil-free and numbers have been increasing since the Land Trust acquired this 450-acre preserve in 2009.